Small but perfectly formed, Orford Primary is a vibrant village school with big ambitions. With around 60 pupils across three mixed-age classes, the school serves Orford and the surrounding parishes of Gedgrave, Iken, Butley, Sudbourne and Chillesford. We also warmly welcome children who live outside our catchment area. Orford Primary School can offer your child a wonderful education in a safe, happy and nurturing environment. We take pride in our caring Christian ethos and close relationship with the local church and community. We are committed to helping our children make the best progress they can regardless of their starting point, and give everyone access to quality teaching and learning. Our broad, balanced and creative curriculum will stimulate your child to acquire knowledge and develop individual skills. We encourage every one of our children to become independent and confident in both their work and social development, and grow up into rounded and resilient human beings. We offer some fantastic opportunities to learn beyond the classroom. 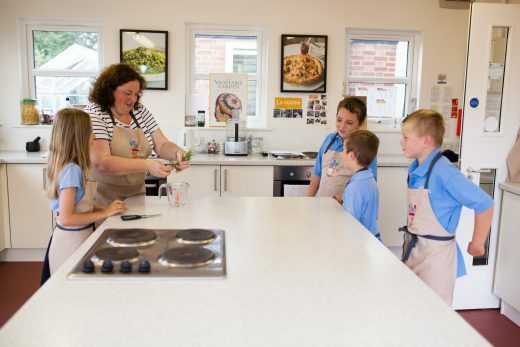 Orford was thrilled to be the original pilot school for Jamie Oliver’s Kitchen Garden Project. As a result, all of our children learn to cook in a dedicated teaching kitchen from the age of four. The children also learn to grow many of their ingredients in our kitchen garden. Recently we were proud to be awarded Level 5, the highest accolade in the Royal Horticultural Society’s ‘Campaign for School Gardening’ scheme. Why not come and explore Orford Primary School for yourselves? We are always delighted to receive visitors. Just call the office on 01394 450281 or email admin@orford.suffolk.sch.uk for an appointment.